CLEVELAND — Once the sweeping was done, LeBron James peeled off his jersey and headed toward the locker room. He stopped on the way to share a moment with his two sons, who held basketballs while patiently waiting to take some shots. James hugged his kids and rubbed their heads. He treated the Toronto Raptors the same way. 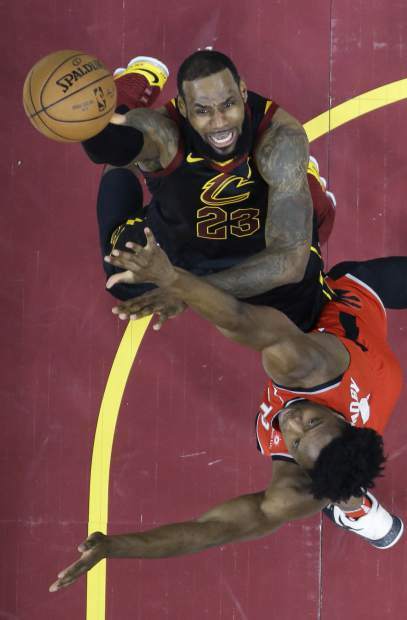 James ended Toronto’s season for the third straight season with a second consecutive four-game sweep as Cavs advanced to the Eastern Conference finals for the fourth year in a row with a 128-93 win in Game 4 on Monday night. 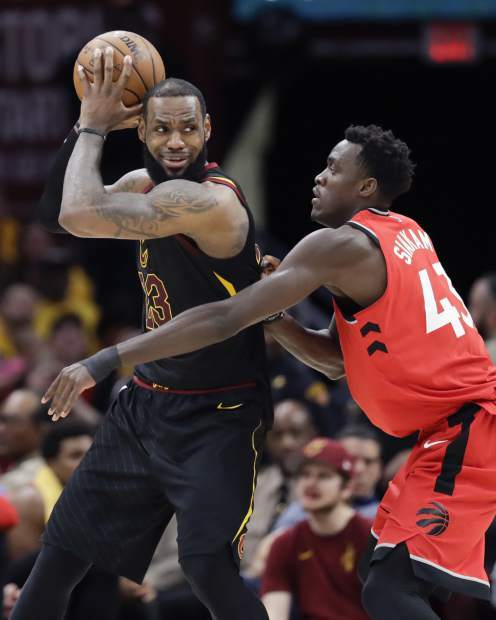 James finished with 29 points, 11 assists and spent some of the final 7:38 dancing near the bench during Cleveland’s 10th straight playoff win over Toronto, which changed its system, its roster and its approach but still can’t beat the game’s best player. Pushed to the max for seven games by Indiana in the first round, the Cavs took care of Toronto quickly — again. Turns out, the Raptors still weren’t good enough. Kevin Love added 23 points and J.R. Smith 15 for the Cavs, who can now rest while waiting for the Boston-Philadelphia semifinal series to end. 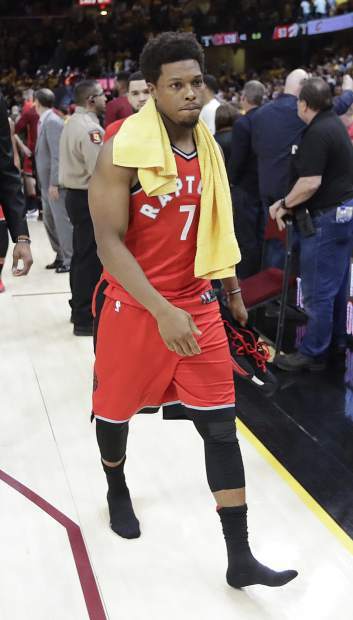 Jonas Valanciunas scored 18 and Kyle Lowry had 10 assists to lead the exasperated Raptors. Toronto’s frustration hit its peak late in the third when All-Star DeMar DeRozan was ejected for a flagrant foul. There will be no historic comeback. 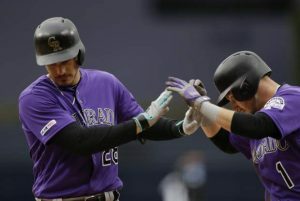 Of the 130 teams to take a 3-0, all of them have won the series. Cleveland’s back in the East finals again despite a turbulent regular season and a bumpy start to the playoffs after the Pacers pushed the Cavs to the brink of elimination. 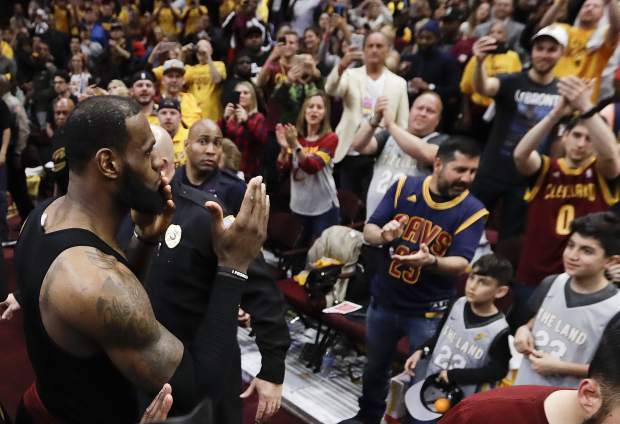 James arrived at Quicken Loans Arena three hours before tip-off wearing a baseball cap that said: “Don’t Trip.” If the message was directed at his teammates, they got it. The Cavs didn’t stumble and had one of their best all-around games of these playoffs after so many tight ones. 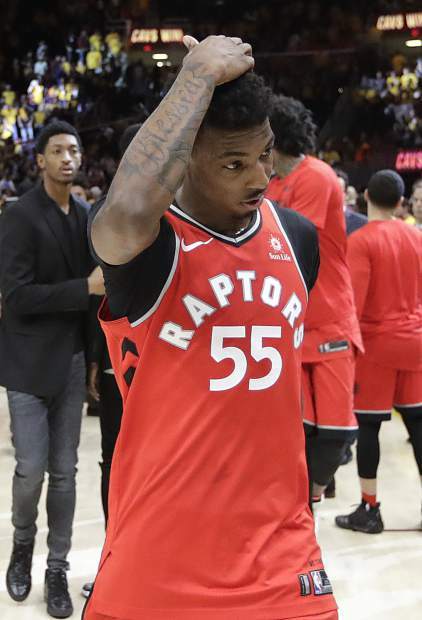 They won Games 1 and 3 over Toronto by a combined three points, needing a buzzer-beater to outlast the Raptors on Saturday night. 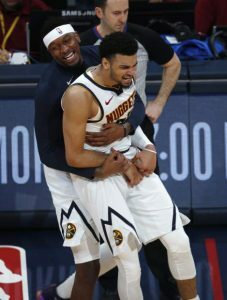 There was no need for such heroics and for a change, James, who came in averaging 41.7 minutes per game in the postseason, had plenty of help. All five Cleveland starters scored in double figures and Love continued his spring rebirth after struggling against the physical Pacers. 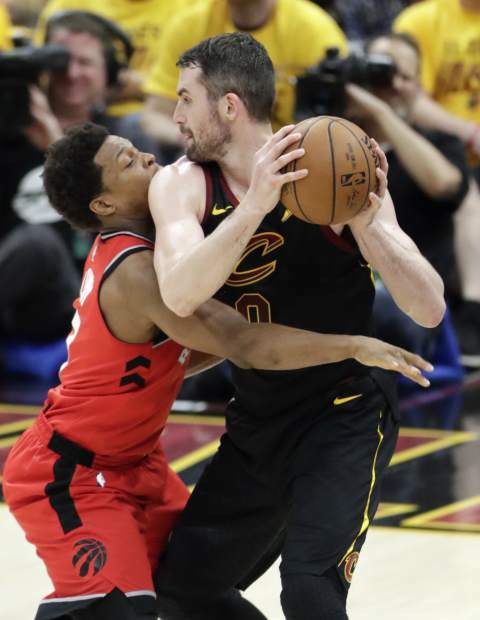 The contributions from Cleveland’s supporting cast came two days after “Saturday Night Live” poked fun at the team in a skit entitled “The Other Cavaliers,” which didn’t air but went viral on social media. Cleveland took control with a 12-0 run over the final 2:12 of the first half. The Cavs didn’t let up, pushing their lead to 30 as their fans finally got a chance to relax and start making plans for the next round. 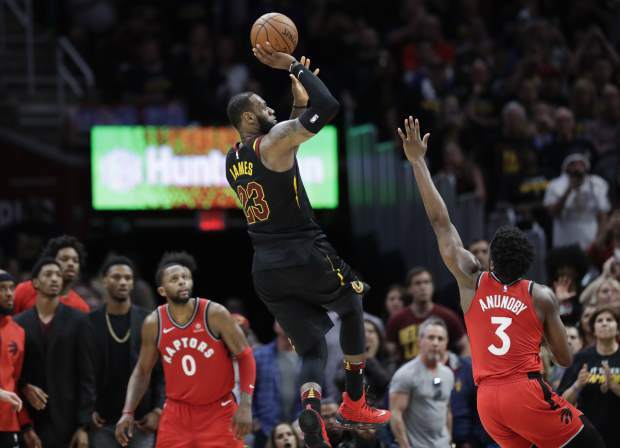 After James dropped a fadeaway baseline jumper to give Cleveland a 27-point lead, the 33-year-old stared at Toronto’s bench as he ran back on defense. The Raptors must see him in their dreams. It’s back to the drawing board for Toronto. The Raptors had the league’s second-best record, the No. 1 seed in the playoffs, a deeper bench and in Lowry and DeRozan enough firepower to offset James. 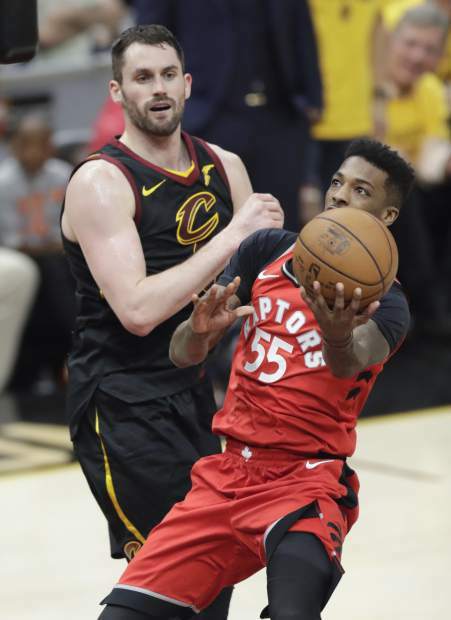 But after blowing a big lead and giving away Game 1 on their home floor, the Raptors never recovered and now face an offseason full of questions and second-guessing. DeRozan struggled to explain James’ stranglehold over Toronto. Casey, looking for a spark to save the season — and maybe his Job — switched starting lineups for the second straight game. He gave C.J. Miles his first start and put Serge Ibaka back with the first five after using him in a reserve role in Game 3. 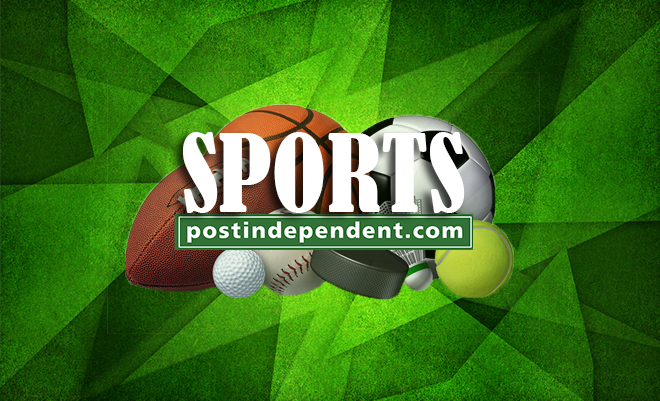 But Miles picked up two quick fouls and the Cavs’ offense was in gear from the start as Cleveland opened 12 of 15 from the floor while building a 26-17 lead. Cavs coach Tyronn Lue was shocked to learn of coach Stan Van Gundy’s firing in Detroit. Lue played for Van Gundy in Orlando and has always respected his basketball IQ. And as rumors swirl about Casey’s future, Lue said Toronto would be foolish to do anything rash. 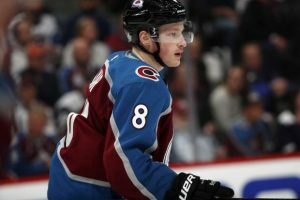 “It would be absurd to make a move like that,” he said. Raptors: DeRozan was tossed after hitting G Jordan Clarkson in the head on a layup. DeRozan finished with 13 points after sitting out the fourth quarter in Game 3. … Fell to 0-7 in playoff games in Cleveland. … Didn’t lose three straight during the regular season, then lost four in a row to the Cavs. Cavaliers: Improved to 10-0 in Game 4 closeouts. 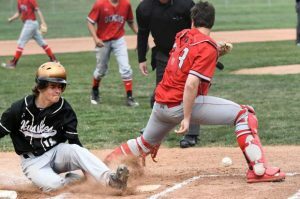 … Won their 15th straight second-round game dating to the 2015 playoffs. 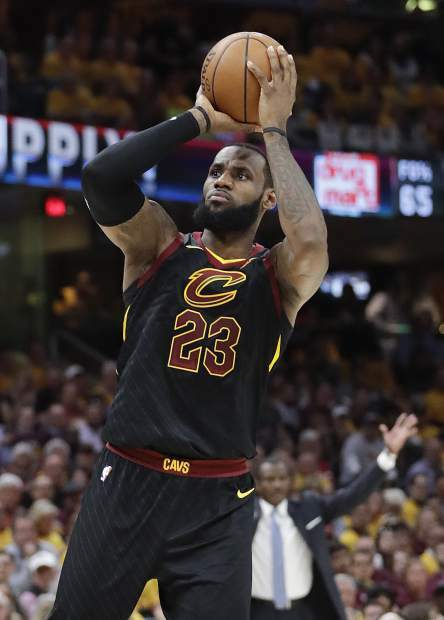 … James entered Game 4 with 348 points in these playoffs, the most through 10 games by any player since Michael Jordan (354) in 1992. … Love became the fourth player in Cleveland history with 500 career playoff rebounds, joining James, Thompson and Zydrunas Ilgauskas.